Well I never thought I’d be writing my own success story, but here I am! Wow, this is one of the most satisfying moments of my life. Who would be crazy enough not to hire someone with 10+ certs?! I must share my strategies with you!!! I believe anyone can follow in my footsteps and earn at least 10 certifications. Now, I don’t think it’s healthy to attempt to get 10 in 10 days, however, I think it’s very realistic to get 10 in 10 months! For the rest of this series, I’ll be giving you a step by step guide to earning 15 certifications. But for this one post, let me tell you my story. Everyone can use a spark to begin achieving big things. I hope this post can be that spark for you. 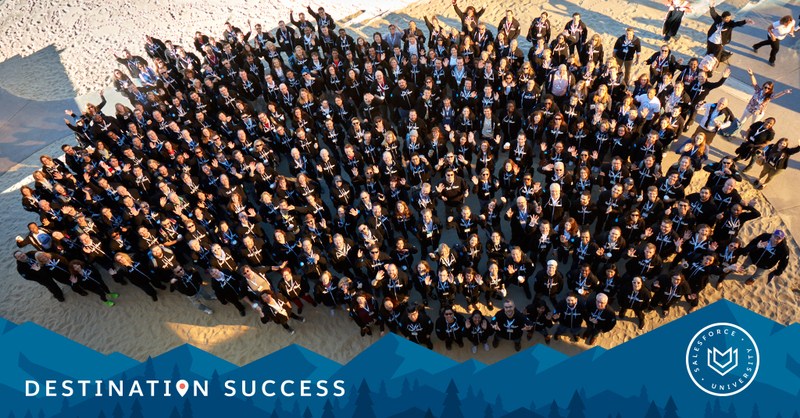 For me, that spark was Destination Success, a Salesforce certification event. I didn’t plan to go there to get certified. In fact, I didn’t plan any of this. My goal for that event was simply to give a great session, and, if I got certified in the process… great! But that’s just the thing about these sparks. Sometimes, they hit you and you don’t expect it. Funny, because at Destination Success I unknowingly sat next to Michael Drzewiecki, the man I’m calling the master of certifications. I learned that Michael earned 14 certifications in the past 6 months. And the wildest part? He only started learning Salesforce a year and a half ago! I thanked Michael for sharing his story and techniques with me, then, I set a goal for myself. 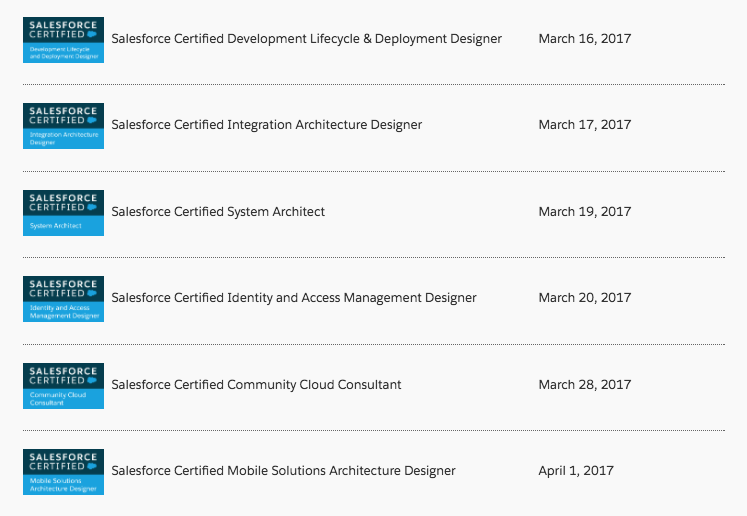 My goal was to achieve 12 new certifications by the end of 2017. I’m not gonna lie, I was dead scared. Deep down I couldn’t avoid this sinking feeling that I wouldn’t be able to achieve my goal. Most of the certifications I needed to pass were at the Architect level, and surely, I thought, they had to be far more difficult than the other certs I had passed! I decided to start with the Data Architect certification, the topic I felt the strongest in. I studied, and I studied, and I studied (don’t worry, I’ll be sharing the specific materials in the full guide). Even though I was in Las Vegas, I chose to focus on my goals. And I passed! I would have taken time to reflect on my first success, but given the format of Destination Success, I had less than 24 hours before my next test. No time to daydream! The second certification I chose to do was the Sharing and Visibility Designer. Throughout my career I’ve had to do plenty of OWD settings and sharing rules, so I felt like this was my second strongest topic. I crammed as much studying as I could in 24 hours. Surprisingly, I also passed! That’s when it hit me. 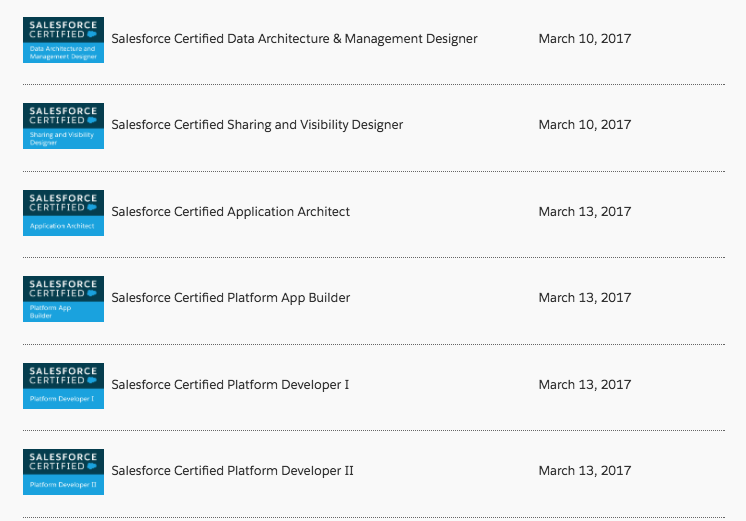 These tests were hard, but no more difficult than all the other Salesforce certifications. Even though they had “Architect” in the name, the material was just as learnable as any other cert. And, there were plenty of official resources to learn from via the ebooks. It was at this moment I knew the only thing preventing me from succeeding would be lack of effort. All the resources I needed were available for free online. I had no excuse not to succeed. I stuck with the plan and my certification count continued to climb. It was glorious. But I had saved the hardest certs for last. My arch rival: Identity and Access Management. I had so much momentum at this point though that I was getting complacent. On one hand, I didn’t have as much experience in this topic as I would have liked. On the other hand, I had passed so many certifications that I was overconfident and took the test before putting in my hard work. I failed the test. Then I failed again. Normally, this would have been crushing for my ego. But I remembered something Michael told me: “You either pass, or you learn.” It was a great reminder for something I’ve always followed in my career. I should never be ashamed with failure. The real shame is not trying. I doubled down on my plan and my studies. I created a study guide summarizing the important points I needed to remember. I took an honest look at the material I was weak in, and studied them until they became my strong points. Then, I slayed my demon and passed. In fact, based on the scores, I dominated it! By the end of the month I completed my goal ahead of time and earned 12 new certifications. It was an absolutely euphoric feeling knowing that I dramatically improved my Salesforce knowledge, my market worth, and my confidence as a result of my hard work. Even better, I decided early on that if I succeeded with my goal, I’d reward myself with something nice. Something fancy and expensive, because hey, I’d earned it! I decided to spend my gift on my wife instead. A Vitamix blender, something she has always drooled over. I couldn’t have done it without her, she took on extra baby responsibilities so I could study. Plus, my real arch rival was coming next. It didn’t feel right celebrating until I finished my true goal: The Technical Architect certification! Next post: Checklist: What to do before attempting certifications! wow! thanks for the mention David! congratulations on your success!!!! Couldn’t have done it without you Mike, THANK YOU!! Great stuff, David! It’s comforting in a way to know that even after all the time you put into SalesForce that you’re not just breezing through this stuff in your sleep. Currently working up the courage for my 3rd try at the Platform Dev I cert, and this definitely helps. Thank you, as always, for sharing! Hahaha nooooope, still a TON I don’t know about Salesforce! Do you have study advise for Advanced Admin, App Builder, Dev I, etc. I see the ebooks here but how did you study for so many certs back to back for the lower certs? I take the Advanced Admin at the end of the month. The blog makes me think I can sign up for App Builder too. Just wondering what study material is best? Just amazing and you’re doing great job to inspire all of us. The failure you shared is always a good part of the story and how you converted it into Success is the best one. Congrats to your wife as well !! Keep it up and I’m sure you will achieve all of your goals including Technical Architect Certificate. Even I had a goal for this year to complete 5 certifications. I climbed successfully the first step (Sales Cloud). Thanks for this inspiration story.. Thank you for sharing your story, you had always inspired me (not only me but many others). Many Congratulations for your certifications. I have 2 Certification with me and I had planed to have 5 certification before the end of the year. As you have said “Everyone can use a spark to begin”, for Me you are the Spark. You are the real Roll Model for me in SFDC Community. Thank you Nirav for the kind words!! Technically I have 17 or 18, but I don’t really count my transition exams towards the total since the old ones got replaced. Also, I feel horrible that people can’t get the “old” certs, so I keep my count to the new ones only. Have you happened to complete all 5 certifications? If so, can you help me out please. Ha ha ha thanks Ram! If only you knew how many times I’ve failed in my career! Heck, in the past week! LOL! Just passed the Admin certification :) I have couple of questions regarding the other 4 in the 5 essential cert list. Would really appreciate if you can let me know how to reach you. Astounded! I have been struggling to get motivated to take my first cert and you go and do something like this..
You can do it too EK!! Half the battle is showing up!! !